It is not about controlling the cat during a cat grooming session. It is about us changing HOW we work with the cat – in other words.. working WITH the cat. Patience and understanding are the key with each individual cat. Due to the problems presented to owners of cats that hate grooming I have started offering personalised home consultations that are part behaviour/part grooming. Every cats personality and needs are different and every cat has to be approached with this in mind. There are different levels of aggression and also different reasons why behaviours are occurring. A behaviour assessment, including a full history of your cat, will be done alongside a home visit. Part of the assessment will include various grooming techniques so I can see personality how your cat is reacting. From these reactions I will be able to explain to you what I feel is happening and the reasons behind them. A full groom will be part of the fee depending on the responses of your cat and what is concluded from my personal evaluation. You will be shown handling techniques where possible and sent links to the correct grooming tools if you do not possess them already. A behaviour/grooming report will be sent to you along with a tailored step by step programme for you and your cat. Continued support will be given. I can travel to most of England so please do not hesitate to ask. 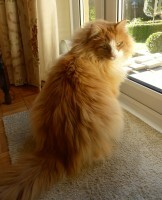 if you are interested in a tailor made cat grooming consultation for aggressive cats then please get in touch. Alfie was a 12.5kg hissing, spitting ball of ginger fury when we took him home from the animal shelter with his sister Ems. We had been asked to warn our neighbours before we allowed him outside – Alfie was unwell and this made him aggressive and unpredictable, and as he is the size of a medium dog he could do some damage! Over the next few months Alfie settled down and became quite a loving cat at home, but his illness meant he had to be taken to the vets for tests, x-rays, biopsies etc. at frequent intervals – and he DOES NOT LIKE VETS. It got to the point where the vet had to sedate Alfie within the first few minutes of an appointment – literally injecting him while still in his carrier – for their own safety, as Alfie had no compunction about sinking his claws in and would go wild upon entering the surgery. The vet refused to deal with him unless he was sedated this way. Understandably, local groomers also refused to try grooming Alfie, but I was getting desperate to find some way of keeping him matt-free without knocking him out first as Alfie was already 5 years old and it only gets more dangerous with age. However, grooming him myself was not an option, as Alfie was quite willing to swipe at me too when I came near with a brush – and one swipe took over 4 months to heal! I finally found Anita through a Google search for grooming difficult cats – and I was so relieved when she said she would be willing to try to groom Alfie without sedation. It was a small ray of hope at last! First of all, Anita made sure she knew exactly what I thought she would face, so she could come prepared, with a thorough consultation via email. I was confident she would treat Alfie well, and I couldn’t wait for her visit as Alfie had developed huge matts all over his body and I was extremely reluctant to take him into the vets for “just a shave” as he had already been sedated 4 times in 6 months. When Anita arrived, I was stunned by how quickly she bonded with Alfie – who hissed and swiped at most visitors, but was happily digging into her carrier bag of treats and playing – PLAYING! He never played! – with her rod toy within minutes. I had become convinced that Alfie was a terrified and misunderstood cat, as he behaved so differently at home with us compared to at the vets’. Anita opened my eyes to the fact that he was playing me like a Stradivarius, and actually, he was a moody teenager determined to get his own way, and happy to use tooth and claw to get it! Anita not only successfully groomed Alfie without sedation (managing to shave his entire back and most of his sides without a single clawing) but she also taught me how to recognise when he was really scared or exhausted and when he was just acting up. She taught me how to hold him safely, how to distract him, how to play with him, the best way to brush him but most of all, not to be frightened of my own cat. I can never thank her enough. But with Anita, the care does not stop after the grooming is done. There were a number of follow-up emails with advice on issues that had come up during the groom; recommendations on toys to try; and even suggestions on programmes on cat behaviour to watch! Especially, when Alfie had to go to the vets again a week later, and came back with stitches after a shaving had gone horribly wrong – I was devastated and nearly hysterical, but Anita was there through it all. She helped me get in contact with a new, more holistic vet in my area, and is still always available if I have a concern. Thanks to Anita, I can now take Alfie to the vet and he hisses, but will accept strokes; he plays like a normal cat, despite his many health issues; Alfie has more respect for me and I am a much more confident owner. Thank you so much Anita!!! Finding Anita came about after I searched online to help me find a solution to my annual problem with my Norwegian Forest cat’s matting winter coat. The issue is he hates being groomed. asked her if she would travel from London to help us. Obviously the cost for this was high and I had to think about it very carefully. However, in the end Anita came to visit and to teach me how to groom. She came armed with toys and initially introduced herself to Ole whilst getting to know him. Anita also showed me what I should wear for protection during a grooming session and the techniques I should use to hold him. Importantly she showed me that almost all of the grooming tools I had acquired over the years were useless apart from one comb. So then she began to groom. Ole immediately reacted and began to fight and growl which, I confess, was quite distressing for me to see. However, Anita showed me that when she stopped and played with Ole he was fine and he didn’t try to attack her. He was purely fighting the grooming and this was not because it was hurting but because he quite simply didn’t want it to happen. He didn’t want anyone to be controlling him, having been getting his way for so long! Anita persevered and I assisted trying to learn along the way. She had frequent breaks for play with Ole but it was a long and exhausting process for us all. I learnt a great deal about how exactly to comb the coat in small sections and ways to hold Ole. At the end Ole and I were exhausted physically and mentally, as he never stopped fighting for the entire process. Anita had to trim quite a lot of his fur off with the clippers as his rear was so matted. Anita had summed up by advising that my husband would have to help me as Ole was so strong and she left a little message on my phone to my husband to explain this. She then followed up with notes and advice on the correct tools to buy. She has kept in touch and subsequently went to the trouble of producing a video of how she grooms her own disapproving Norwegian Forest cat, which reinforced all the information she had given me during the groom. This was very useful to remind me of techniques. Since her visit I have had greater success grooming Ole who still dislikes the process but who I think has, in a way, resigned himself to the fact it will be done now whether he likes it or not. Ultimately Ole’s coat is now looking great and matt free so I feel so much happier. Although it was an expensive day, to bring Anita out from London, I think ultimately it was worth it, as I now understand what’s required. Despite Ole’s protestations, it is not hurting him and I realise that I have to get the grooming done. I know Anita will be online to offer expert advice in the future if I need it but I’m now hopeful we have turned a very important corner thanks to her patience and advice. I’d highly recommend Anita’s expertise to anyone looking for specialist cat grooming advice for aggressive or difficult cats.